Jamie Parrish of Minneapolis takes a selfie in front of the closed sign at the National Archives, Dec. 22, 2018, in Washington. Congress' inability to approve a funding measure that includes money for a proposed U.S.-Mexico border wall has led to a partial government shutdown. As talks dragged on between Congress and President Donald Trump over funding for his border wall, the U.S. Senate adjourned Saturday afternoon, with no plans to meet until Thursday. A partial government shutdown, which began at 12:01 a.m. Saturday, was triggered by Congress' inability to agree on a funding measure to keep the government open. The shutdown affected more than 800,000 federal employees, more than half of whom will continue to work without pay. Shortly before Senate Majority Leader Mitch McConnell of Kentucky announced the Senate would adjourn until Dec. 27, reporters said Vice President Mike Pence had arrived at the Capitol to speak with Senate Minority Leader Chuck Schumer of New York. McConnell said the Senate would meet in a "pro forma" session Monday, but those sessions are brief, sometimes lasting just minutes. 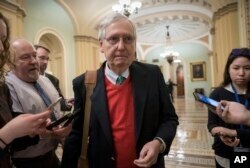 Senate Majority Leader Mitch McConnell, R-Ky., is met by reporters as he arrives at the Capitol on the first morning of a partial government shutdown, as Democratic lawmakers, and some Republicans, are at odds with President Donald Trump on spending for his border wall, in Washington, Dec. 22, 2018. Earlier Saturday, Trump discussed border security with Republican lawmakers and senior aides at the White House. During a conference call Saturday with reporters, a senior administration official was asked why Democrats were not present at the meeting when Trump had repeatedly said they were responsible for the shutdown. “It's important that Senate Democrats come to the table and begin to negotiate with us,” the official said. “Conversations last night did occur. We hope those continue this day, tomorrow and into the future. But it is important for them to acknowledge that border security, physical barriers, need to be part of this package." McConnell said any agreement on a funding measure would need to be approved by the president and congressional leaders before it could come to a vote. Schumer and House Minority Leader Nancy Pelosi of California issued a joint statement Saturday saying, "Democrats have offered Republicans multiple proposals to keep the government open, including one that already passed the Senate unanimously, and all of which include funding for strong, sensible and effective border security — not the president's ineffective and expensive wall." After the Senate had adjourned, White House press secretary Sarah Sanders told reporters at the White House, "Due to the shutdown, President Trump will remain in Washington, D.C., and the first lady will return from Florida so they can spend Christmas together." The Senate late Wednesday approved by voice vote a stopgap measure that would have prevented the shutdown, but it did not include $5 billion Trump wanted for the border wall, and he balked on Thursday at signing it. The Republican-led House of Representatives then passed a temporary spending bill Thursday that included $5.7 billion for the wall and funding to keep the government running until Feb. 8. On Friday, the Senate advanced that bill with a procedural vote that provided "flexibility" to continue negotiating, McConnell said. But, facing a midnight deadline, Republican leaders could not produce the 60 votes needed for passage. Senators adjourned, and about a quarter of the government ran out of funds at 12:01 a.m. Saturday. Trump and Democrats blamed each other for the shutdown. After previously saying he would "proudly" accept responsibility for it if Congress did not pass legislation that included funding for the wall, Trump tweeted Friday, "The Democrats now own the shutdown!" 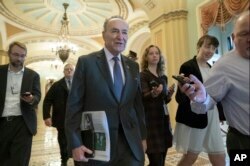 Senate Minority Leader Chuck Schumer, D-N.Y., is met by reporters as he arrives at the Capitol on the first morning of a partial government shutdown, in Washington, Dec. 22, 2018. Schumer told colleagues on the Senate floor Friday that Trump was making unilateral decisions that were creating chaos throughout the world. "All of this turmoil is causing chaos in the markets, chaos abroad and it's making the United States less prosperous and less secure," Schumer said. "There are not the votes in the Senate for an expensive taxpayer-funded border wall. So President Trump, you will not get your wall. Abandon your shutdown strategy." McConnell argued for the wall's funding, saying, "The need for greater security on our southern border is not some partisan invention. It's an empirical fact and the need is only growing." Trump has said his proposed wall, whose total estimated cost is $20 million, will thwart illegal immigration. Construction of the wall was a popular rallying cry at Trump campaign events during his successful 2016 run for the White House. Trump also told his supporters that Mexico would pay for the wall. The senior official stressed to reporters on Saturday's conference call that the administration continues to believe Mexico will pay for the wall, but the White House is not going to "wait on negotiations" with Mexico to be able to start its construction. He added that president was not insisting the wall has to be "some kind of concrete barrier" and that he was open to a "steel slat" structure. The dispute was occurring in the last days of Republican control of both houses of Congress. Democrats picked up 40 seats in the 435-member House in the November elections and are set assume control in early January, although Republicans will maintain their edge in the Senate. The Schumer-Pelosi statement on Saturday said that "if President Trump and Republicans choose to continue this Trump shutdown, the new House Democratic majority will swiftly pass legislation to reopen government in January."